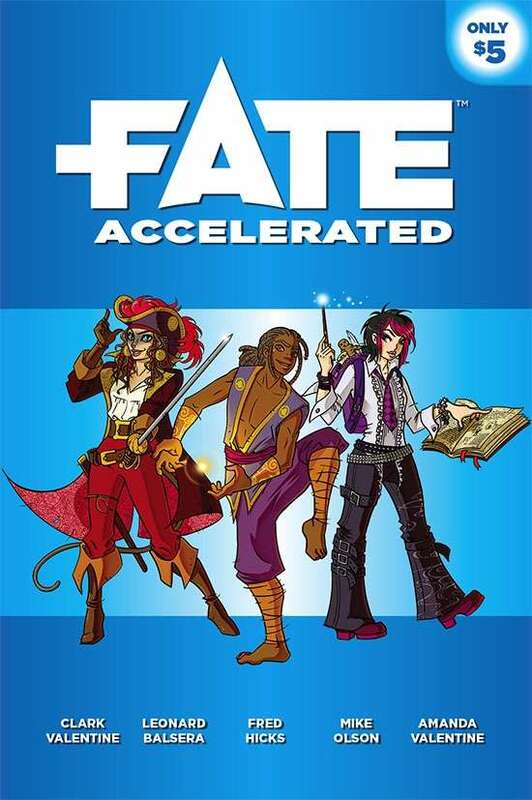 Fate Accelerated, or FAE, is a condensed version of the popular Fate Core system that brings all the flexibility and power of Fate in an easily digestible—and quickly read—package. With FAE, you and your friends can step into the world of your favorite books, movies, and TV or you can create a world of your own. And set up is simple—you can be playing in minutes. Whether you’re new to RPGs or an expert gamer, FAEbrings something special to the table. This PDF is available on a Pay What You Want (PWYW) basis! Provided in PDF, ePub, and Kindle formats. Is this meant to be a digest-sized booklet? If I were to print this as a booklet (in Acrobat), would it be A4/A5 facing pages? I tried to get it printed at a local shop and the fonts got squished... perhaps they set the margins too wide? Each page is 6" x 9". Is Fate Accelerated Edition an expansion? A fresh system adaptation? A quick-start guide? Fred Hicks suggests that it and Fate Core are better viewed as points of a Fate spectrum than as standalone entities. Maybe that’s true, but it’s awkward from a critical perspective, so I’ve chosen to review it as a separate entity. Unfortunately, the problem with this approach is that comparisons to Fate Core are as inevitable as they are unfavourable. It’s not that a stripped down, simplified, newbie-friendly version of Fate Core is without merit – more that I think FAE does not successfully achieve those design goals. The most alien elements of gaming in Fate – aspect invocations and compels, creating aspects and stunts from scratch, how stress and consequences diverge from traditional hit points – are all presented unchanged in FAE, minus the play guidance. (Although the more restricted list of stunt options are welcome, helping players to choose stunts faster.) Meanwhile skills –...See more the most conventional element of Fate Core, at least from a traditional roleplayer’s perspective – are replaced by approaches. Instead of just describing what you’re doing (Fighting, Driving, building Rapport), FAE encourages you to describe how you’re doing it (Quickly, Cleverly, Forcefully) and assigns mechanical bonuses according to your character’s preferred approach. My biggest problem with the approach system is that, instead of speeding up play, it actually slows things down. It’s usually pretty obvious whether an action falls under the Shoot skill or the Notice skill. It’s harder to determine if a player’s description of an attack is best described as Clever or Sneaky. When your GM isn’t arguing the toss over every other action, you usually get the opposite problem – it’s trivially easy for players to describe almost any action as using almost any approach, which means using their character’s best approach most of the time. And since every player’s best approach is capped at the same value, all characters becomes mechanically identical. Still, other than that, FAE is basically Fate Core, which I love. And it seems churlish to complain about one when the other is available to download for free on literally the same webpage. It’s a shame though – Fate is excellent, but not the easiest game to teach newcomers, and it would be great to have a mini-game that helps GMs do precisely that. That’s not a niche Fate Accelerated is filling for me. To me any system one can plop on a table and then hash out some ideas with his players and simultaneously make characters and come up with an adventure to play out later that night is just choice. ICONS has this nailed down pretty well, but they have distinquished company with FAE. I win with both because the systems overlap a lot since both are descendants of the FATE system. Time spent scouring rule books should be used to creatively continuing the story. I just hope Shadowrun 5th Edition doesn't win. Come on. I remember when my whole gaming group had to buy a round of 3rd Edition rule books over a decade ago. How many times can they retread Adepts, the Matrix, and cyberware? Answer: As many times as we...See more buy it.